Any housing renovation is capable of paying for itself. For example, a bathroom renovation in Baltimore allowed a homeowner to recoup 182 percent of the cost. The family made money by changing the bathroom. You can do this too. You just need a plan. Here are four tips for a stylish and functional bathroom makeover. A professional installation of new bathroom equipment isn’t a bad idea. It’s just more expensive. 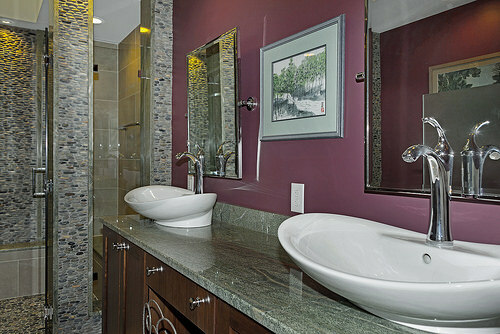 Your goal in a bathroom makeover is to increase the value of your house. You don’t want to spend too much money though. If you do, you waste all the potential savings. A DIY approach is fine. Most bathroom modifications are ones that any self-respecting DIYer can do. Still, you should outsource a couple of tasks. Any plumbing or electrical works is better left to the experts. Similarly, if you need HVAC repair or any type of service in your bathroom, your only choice is a service technician. Otherwise, you could do more harm than good. Make sure to hire the best contractor for this service. For some reason, many people think that a bathroom should look like a dungeon. It’s often a dark area that desperately needs more lighting. A ceiling fixture is usually the only device that emits light. You can fix that with a few DIY enhancements. Buy a vanity mirror that has sidelights. These devices will do more than brighten your bathroom. They’ll also help you look your best each day. You can shave or apply makeup more accurately. You’ll also notice any flaws or imperfections with your outfits. Accent lighting is another good addition. These fixtures are often the most attractive ones, and you only need a ladder and a few tools to install them. Finally, install some dimmer light switches and change your bulbs to a higher wattage. Brighter bulbs will illuminate the room better, which is an important consideration since you’re renovating it. You want to show off the changes. With dimmer light switches, you can control the brightness over the course of the day. Do you like the look and style of an old piece of furniture? Did you replace it in the home but don’t have the heart to get rid of it? Now is the perfect time to repurpose that item to give it new utility. DIY experts have plenty of ideas for repurposing furniture. With a simple internet search, you’re likely to find an idea that seems perfect for your bathroom. Then, your favorite old piece will become a fascinating new one whose story you can still tell. A coat of paint is the cheapest way to change your bathroom. You may believe that it won’t make much difference, but that’s wrong. The perfect pastel color can add an airy backdrop to your new bathroom. By investing a few dollars in paint, you can accentuate your larger changes. In combination with the added light, the new paint job will make your bathroom seem warm and inviting. Some of the best bathroom renovations are cheap. None of the suggestions listed here will cost much money, but they will make your bathroom seem nicer.